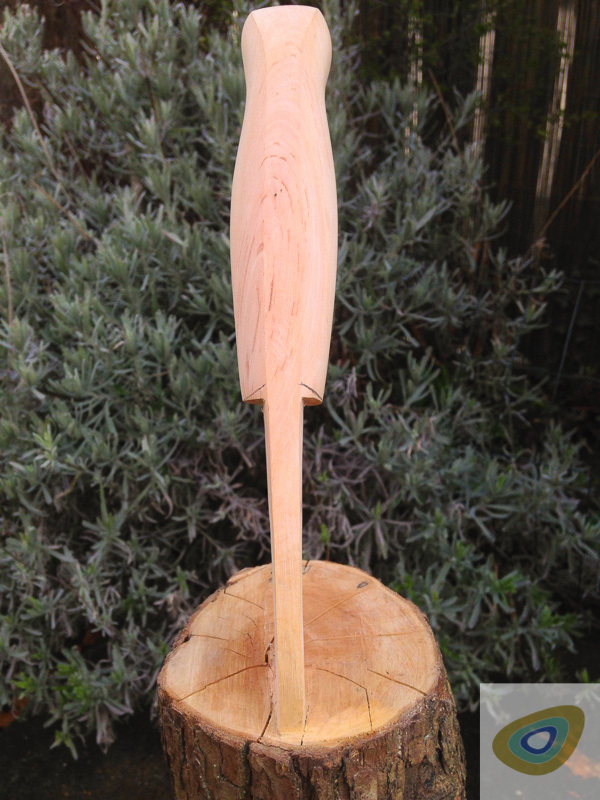 A few years ago I wanted to carve a knife out of wood, as if it had just been stuck in the top of a log. I came up with this idea after having seen some pictures of knives displayed this way. I gave it a lot of thought and then came up with a plan and set about my new project. 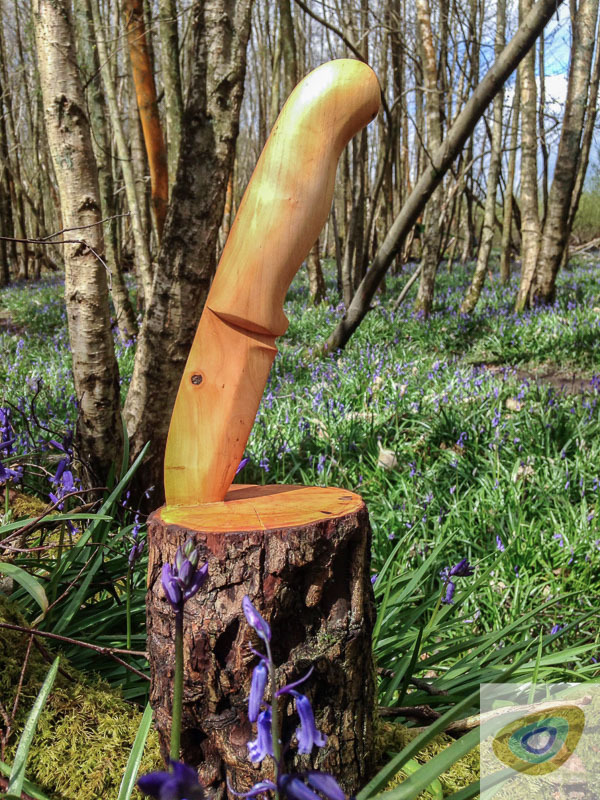 The first one I carved was given to Ben and Lois Orford but unfortunately this one was stolen from their display stand at a show. 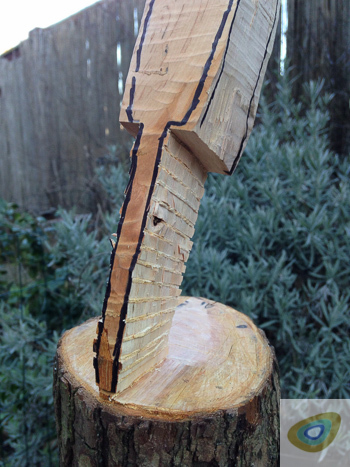 So, I carved Ben and Lois not only a replacement knife, but also a carving of an axe, both of which are replicas of Ben’s work. 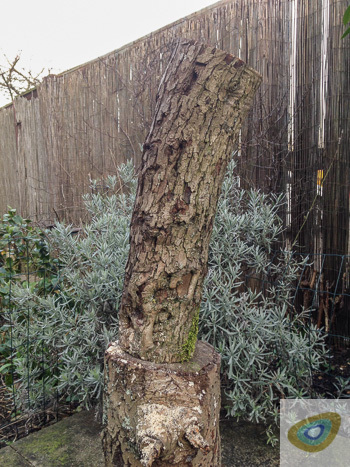 I found a lovely piece of dead standing Hawthorn. I chose dead standing as opposed to green as it is less likely to split when drying out. I made side and front view paper templates of the knife which were to scale and used these throughout the carving process. I now present a step by step photo record of how I approached this project. 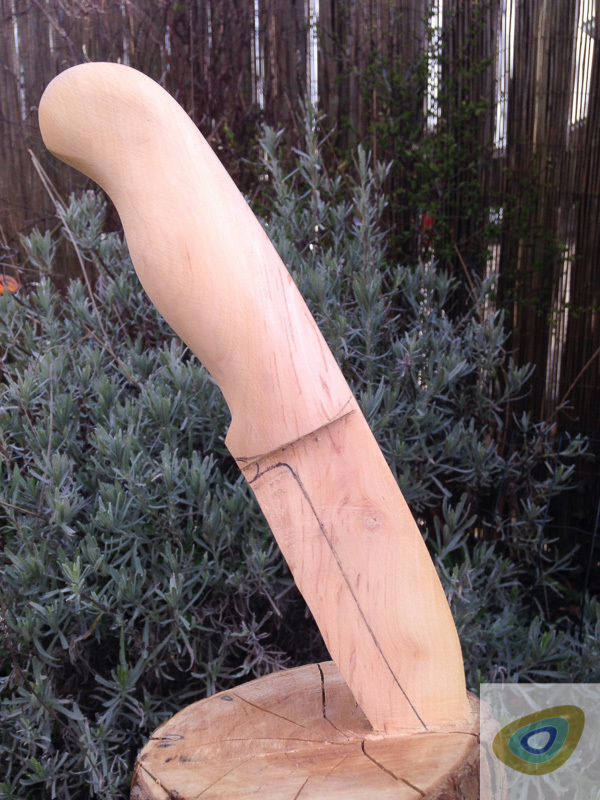 The piece of wood selected was about 18 inches long and four inches wide fairly knot free with a slight curve in it. 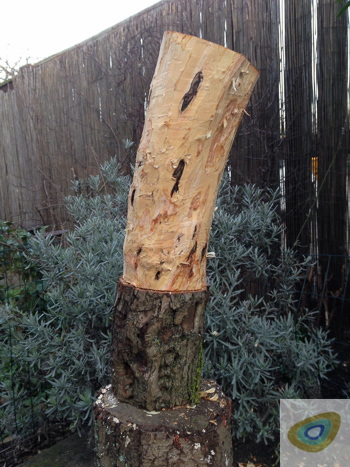 Then I made a level saw cut, to the depth of the bark, all the way around the log. 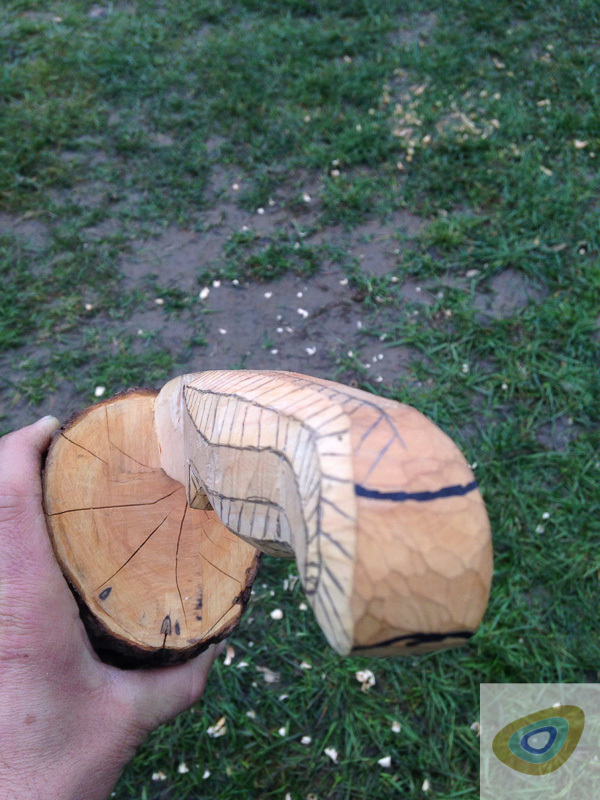 This cut around the circumference marked the point at which the knife would be stuck into the log. 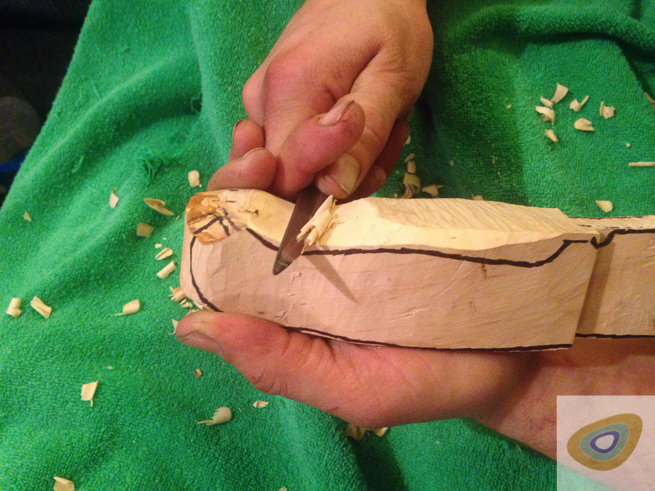 I then stripped the outer bark from the half to be carved into the knife. 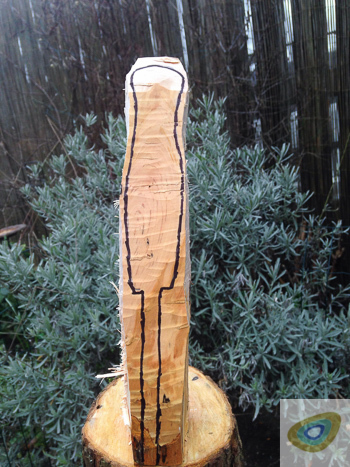 I then used templates to draw the two dimensional profile shapes of the knife onto the wood. These were based on photographs of Paul's knife. 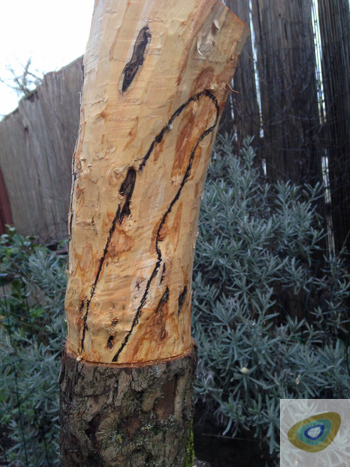 First, I made stop cut on the same saw line where I cut originally to de-bark. 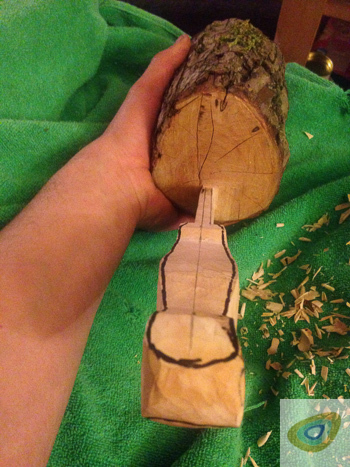 This cut is where the point of the knife will appear to be stuck in the log base. 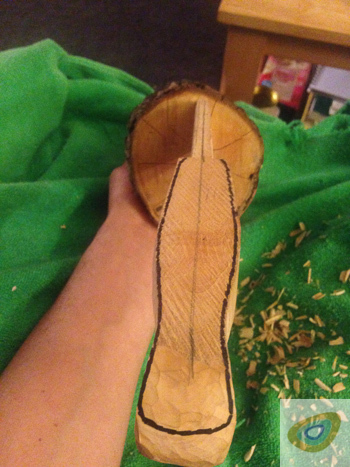 Then, I began with carving away the sides. Removing some wood meant I lost my sketch, so after a while I re-drew the front profile. Similarly later on with the side profile. It's important not to lose sight of what you are trying to achieve. 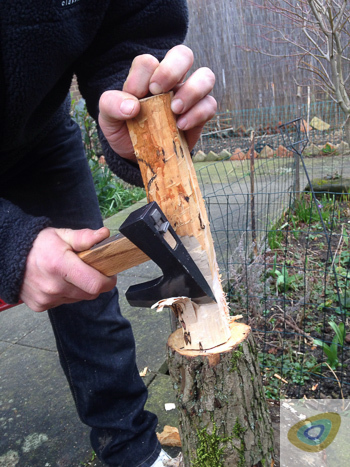 I put the axe down for a moment to make some saw cuts. These are made down towards the template lines drawn on the wood and help remove further material quickly and efficiently. Accuracy is key here, do not cut past the blade lines. 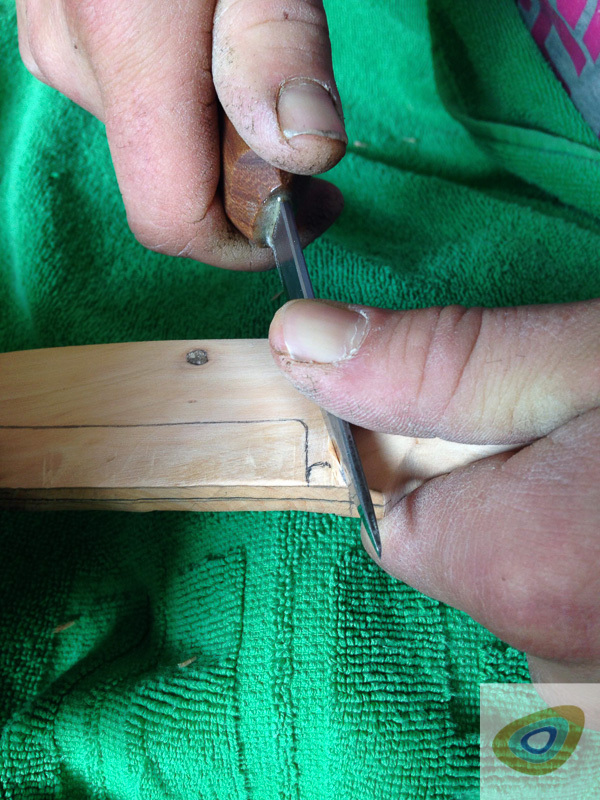 Getting The Shape; Remove All Excess Wood From Between The Saw Cuts. 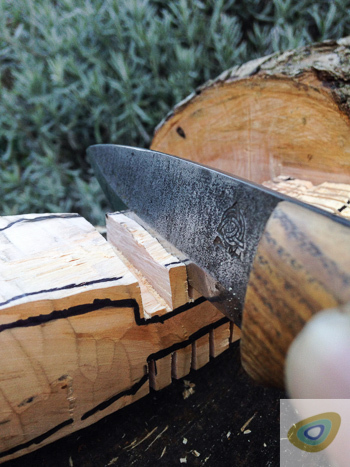 Gently and carefully break out the pieces of excess wood so you end up with the rough outline shape of the knife. 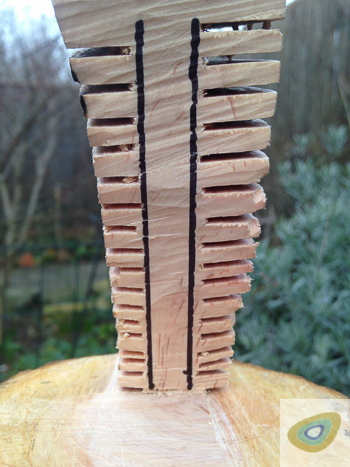 I used my Ben Orford 4" Woodlander knife for this as it is ideal for close, fiddly bits like this. 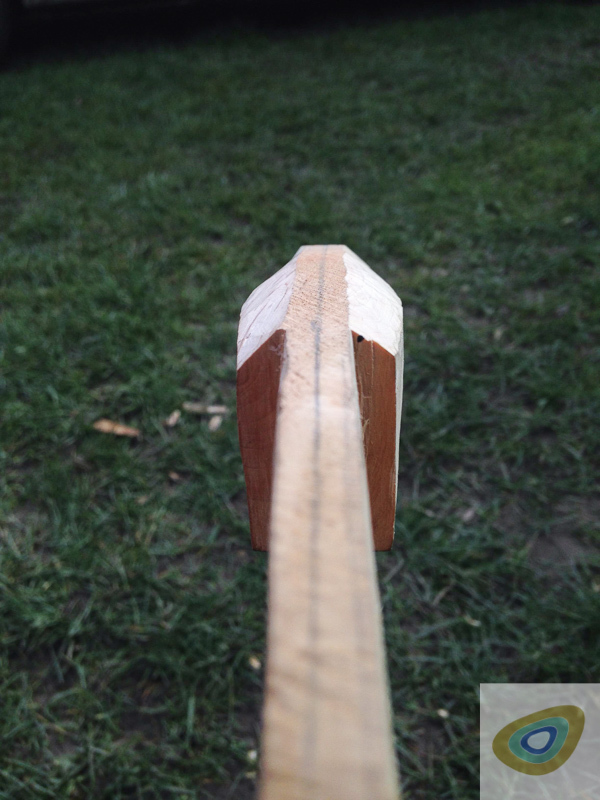 This is close work so I took my time over this part, carefully shaping the wood right up to the template lines. I continually checked from all angles to ensure lines were straight and balanced. 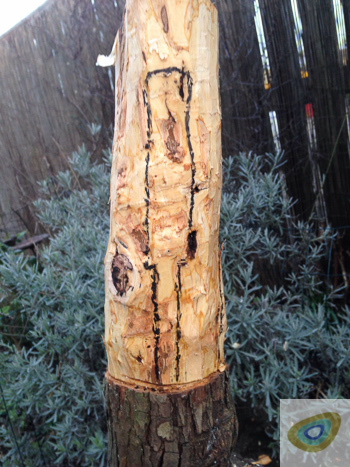 I used my Ben Orford English Sloyd carving knife for this. Now you need to cut the corners off to get the curves. Make sure you cut equal amounts on both sides. 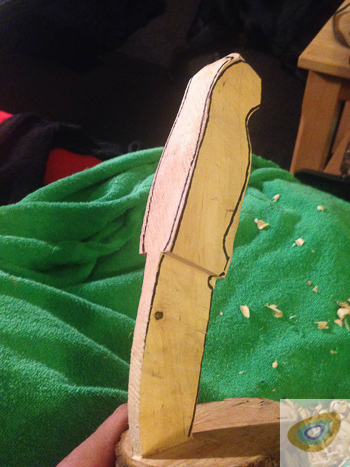 I have drawn lines on the knife to help me, but again, I continually check all angles during this process. Take your time at this stage and do a little at a time so as to prevent taking too much off. You should be able to feel when you have the curve right. 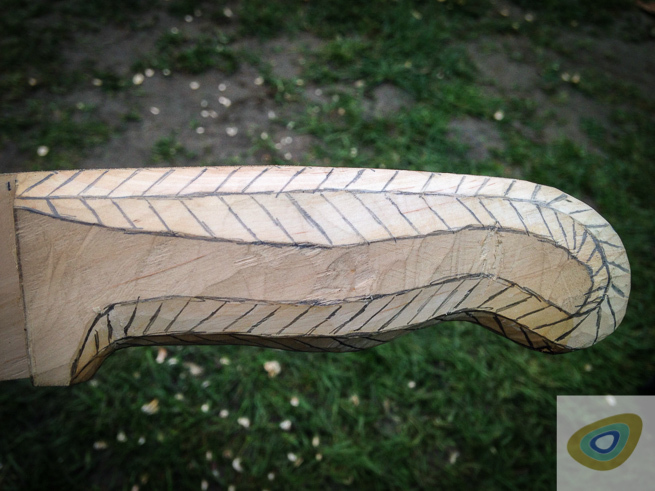 Don't worry about the pencil marks as they will come off once you start sanding. At this stage, I refer back to the original knife, or images, to add any fine details that make it a true representation. For sanding, I use Abranet as I find it does a better job than regular sandpaper, particularly on fine carvings. To finish, I just applied a light coating of Walnut Oil which gives a lovely sheen. 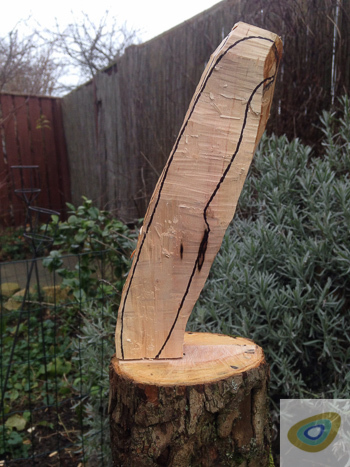 It would be fantastic if this photoblog inspires you to carve something similar. Feel free to ask any questions about this or any other featured project. Good luck if you have a go and don’t forget to send pictures! 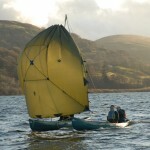 Paul Nicholls a.k.a "Spoons", from Bedford, attended his first Bushcraft course in 2008, where he met Paul Kirtley, who was leading the course. 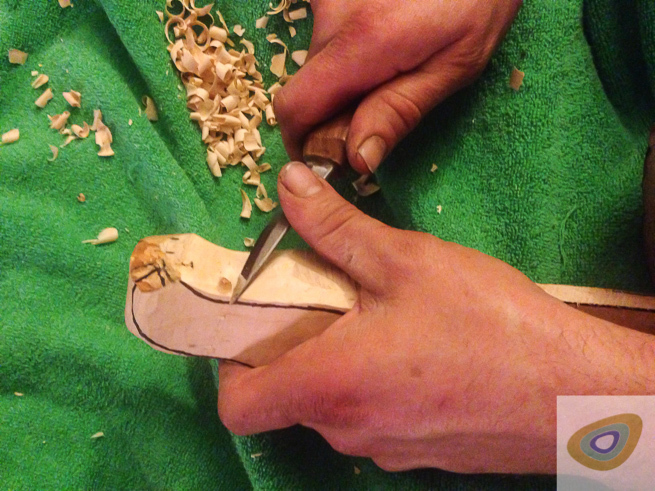 The course had a huge impact on Spoons and he spent the subsequent six years learning and practising more new skills during which time he developed a particular love of carving. 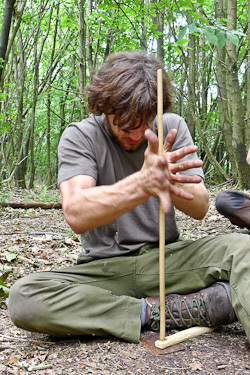 After helping with Frontier Bushcraft informally in 2013, he worked as part of Frontier's Instructional team on UK summer courses between 2014 and 2017. Fabulous, been looking forward to this blog and not disappointed. Brilliant piece of work and great post to show how it was done. Thanks spoons. 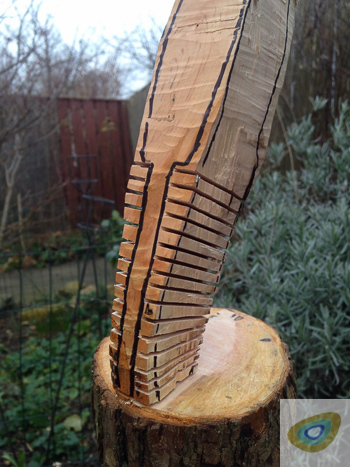 Excellent carving from a genius idea. Paul, that was beautiful work. I am inspired. I may just try that, but which knife will I carve? Hmm?